BaybyeData Technology Group is a global provider of secure data erasure solutions. 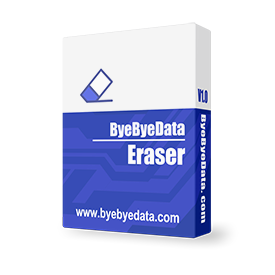 ByebyeData Eraser is a data sanitation program to protect sensitive and private data on your hard drive of home users and business users. It overwrites hard drive multiple times with government erasing standard. It is currently supported under Windows XP, Windows Server, Windows Vista, Windows Server 2008, Windows 7, 8, 10, Windows Server 2012 and Windows Server 2016. Completely erase system/boot partition with bootable CD/USB. Many program files are stored in system disk drive by default.